The long wait between issues two and three of Jupiter’s Legacy have paid off in a big way. Mark Millar has upped the brutality in this current issue while Frank Quitely contributes another off the chart visual performance. Even with the extended wait, it’s hard to believe we are only three issues into this story. It reads more like an event than an ongoing series when you consider the densely populated super hero universe and the sheer magnitude of power possessed by these two warring factions – you really get a sense of the scope and ambition of this book. Bringing an air of realism to a super hero book is not a new concept – we have seen it many times from Watchmen to the more recent Invincible but there is a modern world pathos that Millar brings to Jupiter’s Legacy that is absent from some of these other works. The degradation of the family unit, the rampant drug use and tanking economy all touched on here by Millar lend more than a gritty realism when looked at through the lens of social criticism. It takes on a biting satirical edge in much the same way as Burgess did in A Clockwork Orange, however we are dealing with human society as it effects the super human, which is an altogether new and different perspective. There is something voyeuristic about this narrative in that it feels like we are watching a family fall apart. On a much larger scale we are witnessing events unfold in the super hero community that will have ramifications reaching every corner of existence. The conflict here is like a presidential campaign on steroids – both sides have their own deeply held beliefs and motivations, some are more altruistic than others but in a world where might truly makes right, these ideals are only as strong as those who hold them. Millar does an excellent job writing dialogue for these characters. Although these are new characters, he has given us a look inside them through his sharp, intelligent dialogue and made them feel familiar. Their interaction and collusion paint an accurate portrait of just who these people are and what drives them to do the things they do. The narrative is briskly paced to say the least – events happen in rapid fire succession, sometimes leaving us to wonder if there’s going to be a return to that plot thread later or are we to fill in the blanks ourselves – which can lead to confusion or a point being muddled where it should be crystal clear. This is a complex story full of subtext and sometimes that can get lost in the fast tempo. However, I think Millar is doing a fine job of balancing the fast pace of the narrative with the abundance of information presented – I would just recommend reading these issues more than once to really get the most out of the lush contextual landscape. Frank Quitely is the perfect artist for the realistic super hero story. His clear and concise portrayal of anatomy is enhanced by his knack for dynamic perspective and posing within a panel. Quitely is a master visual storyteller – he employs the location almost as much as the characters as a conveyance device for the plot. Those of you who have read my reviews of his work know that I am an unapologetic fanatical fan of Mr. Quitely’s work, especially when he and a certain Grant Morrison collaborate to make comic book magic, so it should come as no surprise at all to hear that I was floored by his work in this issue. There are so many incredible pages but one of the gruesome highlights would have to be the splash page of Grace’s brutal murder. She is twisted in pain and pierced multiple times by numerous weapons – swords and arrows obliterate her abdomen as her life blood gushes from the cruel wounds of her ferocious assault. The whole thing is a study in slaughter. Another such page shows Brandon astride his freshly murdered father surrounded by his new team mates while his manipulative Uncle Walter stands beside him with his misguiding hand upon his nephews shoulder. The once powerful and majestic Utopian lies lifeless, his face now a smoldering skull with two bottomless pits where his eyes, a father’s eyes, once beheld the world and all he held dear. Quitely expertly captures the emotion in this scene with subtleties like the inclination of Brandon’s head as he gazes up at his uncle and the consternation in Walter’s face as he looks to a future that he will shape from the shadows. Peter Doherty’s dynamic colors add a vivid depth and dimension that truly enliven these pages. 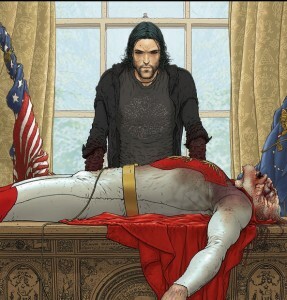 Millar and Quitely have fashioned a world where super heroes are not immune to the problems that tear families apart. Jupiter’s Legacy does not lack action, excitement or a compelling and engrossing narrative that keeps you wanting more – it has all of that. This is a world that is not hindered by past continuity conflicts or preconceived notions of how a character would or should act. This is a new world, but a world no less full of situations that shock and surprise by their very nature – not by juxtaposing behaviors or contrasting norms, but they are shocking simply by the brutal finality that result from them. This is a comic book that doesn’t pull any punches however it does not need to be reined in for being gratuitous or needlessly indulgent. There is a balance here that is not so easily maintained – just look at a book like Crossed and you will see just how hard this balance is to maintain and how awful a book can be when it goes careening off the tracks and into the world of pointless violence and depraved sexuality. Jupiter’s Legacy is first rate across the board and for that reason as well as the myriad merits mentioned in this review. I give this issue my strongest recommendation – add this title to your pull list ASAP. So until next time, see you at the comic book store.